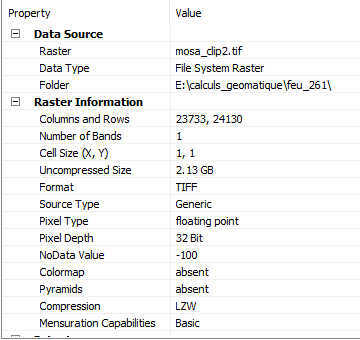 I have a tif file with the specs shown in the attached jpeg. I can't open it. Any idea why ? Total number of pixels is 572 677 290. From memory, I don't think Manifold 8 supports 32-bit per channel TIFF format. I will check. If you can have it converted to FLT format you will be able to import it as a surface. It does, but it seems to have a file size limit. I can split in 2 and import 2 files. Is this file ordinary TIFF or BigTIFF? Manifold 8 does not support BigTIFF (Manifold 9 does). The metadata you posted says "TIFF" not "BigTIFF". 23733 x 24130 pixels x 4 bytes per pixel (32 bits) -> 2,290,709,160 bytes, about 2.1 GB. So this image can fit in ordinary TIFF (even uncompressed), it is well within the 4 GB limit. But maybe the metadata readout is wrong or misleading, and the image has been written to BigTIFF, even though that was not necessary? If Manifold 9 can read it, while Manifold 8 can't, then perhaps that is looking likely. It would be simpler to answer the question having the file, but in general, like Tim says, this is quite likely a limitation of the import in Manifold 8, not a bug. Maybe ArcGIS is creating BigTiff and M8 cannot import it. I imported the same TIF coming from M9 without problem.